Microsoft has never been good with nomenclature. Outlook Express turned into Windows Mail, which turned into Windows Live Mail. Meanwhile, Hotmail became Outlook.com. But there's still a thing called "Outlook" which is not the same as "Outlook Express" or "Outlook.com". So it's no surprise that Microsoft has made a mess when it comes to naming Windows 8. Gone are the days of "Service Pack 1, 2 or 3" that we had with previous versions of Windows. And to replace that, the folks in Redmond seem to have gone with an "8.x" format, which sounds better at first. Windows 8 was released in October 2012. Windows 8.1 appeared in September 2013. But the next big release wasn't Windows 8.2 -- it was called Windows 8.1 Update 1 -- much to the confusion and consternation of the masses. Consumers and IT pros are getting weary of Windows 8 updates, which have appeared more frequently than they have in past versions of Windows. The radical paradigm shift of the original Windows 8 was difficult enough for many users; they may just skip these frequent updates, and that would be bad. Which Windows 8 Do You Have? If you're not sure whether you have Windows 8, 8.1, or the Windows 8.1 Update, check this link for help on how to identify which version you're running, and how to apply the Windows 8.1 Update if for some reason it hasn't been automatically applied yet. Microsoft warns that Windows 8.1 Update is “compulsory;” if you don’t install it, you won’t be able to install any future feature updates, although you will continue to get security-related “critical” updates. Consumers have until June 10 to install Windows 8.1 Update before this policy takes effect. Some have argued that the term “Update” is just Microsoft’s way avoiding its own policies on deployment of “Service Packs” which also make unavoidable changes to the core operating system. Business users get months of lead time before Service Packs become mandatory, but Redmond wants Windows 8.1 Update enforced now. Whether that’s true or not does not matter. Don’t be reluctant to install either Windows 8.1 or its Update. Yes, both make minor changes to the radically different Windows 8 user interface you struggled to learn. But their major changes actually make Windows 8 more familiar to Windows 7 users; easier for mouse-and-keyboard users; faster and more productive overall. Microsoft isn’t really in business to make your life miserable, although it seemed that way when Windows 8 first debuted. Windows 8.1 restored the Start button that many users sorely missed, and enabled users to boot to desktop mode instead of the Start page. Windows 8.1 Update goes further, automatically detecting whether a machine is a desktop or laptop, touch-screen or non-touch, and booting to desktop or Start page accordingly. The user can override this automation and set a specific mode for a given device. I've been running Windows 8 on my laptop, and since these updates were applied, it functions very much like my desktop running Windows 7. If you install the free ClassicShell software, which restores all the familiar features of the Start button, you'll hardly notice the difference. The Windows Store app is pinned to the desktop’s taskbar under Windows 8.1 Update. Also, any Store app can be pinned to the taskbar. This may offend curmudgeons who wish the new-fangled Windows 8 stuff would go away, but it is a good way to integrate modern apps with the desktop experience. There are other blendings of new and old in Update. Right-clicking on a Start page tile opens a familiar context menu of options instead of the ribbons at top and bottom of the screen. Title bars and the time-honored minimize/close buttons now appear along the top of the screen when you open a modern/Store app. In short, there is no reason to avoid these updates and every reason to install them. Bottom line, if you're going to use Windows 8, make sure you've got all the latest updates, and you'll experience a more familiar and usable Windows environment. 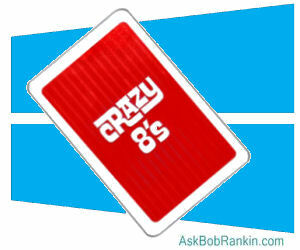 Most recent comments on "Crazy Eights? Come on, Microsoft!" I wasn't happy with MS...from the day I bought my "new" WinMe computer....and have only had newer versions with the "new" PC's I've gotten since. I have a laptop...with Vista...and this PC with Win7. I'd LIKE to update but with upgrades costing almost as much as a new computer ...and not having the $$ to spend(especially on 2 PC's to be upgraded)...what can I do to become more "current"? Amen to the confusion Microsoft creates with all their name changes and you have only provided a sample of the common ones. You have piqued my frustration level again. For what it is worth According to leaked internal documents from the German Federal Office for Security in Information Technology (BSI) that Die Zeit obtained, IT experts figured out that Windows 8, the touch-screen enabled Microsoft operating system is dangerous for data security. It allows Microsoft to control the computer remotely through a built-in backdoor. Keys to that backdoor are likely accessible to the NSA? The backdoor is called “Trusted Computing,” developed and promoted by the Trusted Computing Group, founded a decade ago by AMD, Cisco, Hewlett-Packard, IBM, Intel, Microsoft, and Wave Systems. It's amazing. Every time I read any article about Windows 8 or 8.1 out come all the belly aching nay-sayers. At 75 I have installed Windows 8 on 5 desktops and 2 laptops, updated them to the latest Window Update without any problems. My 75 year old wife who is not computer savvy has no trouble using a mix of programs on her laptop and I honestly fail to understand how something being a bit different from its predecessor creates such hostility. Learning something new is good for your brain and this one's not all that difficult. EDITOR'S NOTE: Not True. See http://www.zdnet.com/german-government-refutes-windows-backdoor-claims-7000019739/ Perhaps. However, not to belabor the point, According to the Chinese news agency Xinhua (May 20) -- China has announced that it will forbid the use of the Windows 8 operating system (OS) in new government computers, a move to ensure computer security after the shutdown of Windows XP? see http://news.xinhuanet.com/english/china/2014-05/20/c_133347210.htm for the full story. Im glad I stayed with windows 7 after all this mess. Outlook? I spoke to a lady today who said that she had a POPUP or something on her new laptop which said download an email address from Outlook for $160AU. What? You paid for an email address after I set you up with Gmail? I'm a volunteer who teaches computer to 'oldies'. I'd never heard of anyone being charged for an email address before. Someone else (never listen to amateurs) had told her that Gmail was no good. Amazing and WHAT A RIPOFF. Does microsoft ever get the message , They just do not seem to care that a lot of users regard the win 8 as a load of rubbish.Microsoft dont seem to care one bit !!!!!!!! Thank you for the Classic Shell link. MS should suggest this as an upgrade to their Windows 8.x product as it could help them to restore some consumer confidence. Maybe Classic Shell can improve Server 2012 for them as well. I am growing weary of Microsoft. Every time they come out with a new version of software, it is more complicated. I went from DOS, 3.1, 95, 98, 2000, XP, Vista, & Windows 7, but that is where I stop. If I buy another computer, it won't software created by Microsoft. Apparently a lot of people feel the same way I do. Well said Chris, I am also 75. And I have no trouble with Windows 8 Pro, Windows 8.1 and I am waiting for the next Update. I have tried any number of times to click on the update and it always says that it cannot update at this time. So I have quit trying. A friend of mine did go to 8.1 and it locked up his computer. He had to uninstall the update and go back to 8. They don't make it easy. I'll ignore Windows 8 until Microsoft upgrades it to run Office 2003 and Access 2007. For the way I use my computer, I can't think of a good reason for not remaining at XP. Whatever "FEATURE" updates are, I probably don't want or need them. The most surprising thing about 8.l, and what compelled me to revert to 8.0 was when I tried to play a hand of FreeCell, I was directed to a store where I was asked for a fee. I was afraid I would be asked for fees to use any MS software. So, I backed off. I may have it wrong, but I have read that if you have updated to 8.1, then you have to instal Update 1 to continue to get security updates. I take it that if you are still only on 8.0 then you are OK. I have read too many horror stories about the 8.1 update bricking the computer during the install, and have avoided it. I find 8.0 runs fine, I have learned how to use it and have no desire to risk an update to 8.1 that may or may not install properly. being a senior, I am not competent enough to deal with a pile of problems should they happen while updating to 8.1. EDITOR'S NOTE: That's not correct. You'll need Windows 8.1 Update as a baseline for future Win8 service and support. I think that problems like the one you mentioned are rare, and shouldn't prevent you from moving forward to the latest Win8 updates. Bob, I read your email articles each and every time they come in. I trust your insight and as mentioned in my original post, am not that confident that I can correct a problem during the update to Win 8.1 should it occur. Having said that, I shall try, on your advice, the 8.1 update and hope for the best. I regularly backup using Acronis, and will do a full system image before downloading the 8.1 update to be sure that I can revert back to where I am now. My other concern is that I have become comfortable with 8.0 and am now going to have to learn how to navigate the OS after the update as it is, I am told, different than 8.0. This whole thing is a pain in the back side, but I guess change is for the better, right? Thanks again for your comments to my original post, and getting me to move forward, albeit reluctantly. Cheers, and keep doing what you do for us less than tech competent computer users. Bob, Just FYI, I finally upgraded to Win 8.1, and with no problems, at least not yet. I do find in the week since the upgrade, that my computer is slower, however, I am able to find my way around, with the help of a Google search to fix an annoying need to log on with a password. Just want to say thanks for convincing me to get it done. I tried updating to 8.1 but after waiting what seemed like hours, it said upgrade failed. I'm unsure how to proceed now. Like a number of other people I was unable to upgrade from Windows 8 Pro to 8.1....because Windows store won't recognise me as system administrator---I have tried a few suggestions off the web, including trying to download from another site manually, but none have worked so far.